For those that want something better than a tub/shower combination in their bathroom, the next step up is usually to install separate tubs and showers. This gives a lot more flexibility in design, as well as allowing you to have a bigger shower than you would have otherwise. Of course, separating the two also makes for some great tub designs, rather than the standard we’re all used to seeing. The secret to making any stand-alone shower is the shower pan. Most are fiberglass shower pans, but some area also made of acrylic plastic. Either way they are roughly the same, and are installed in the same way. Fiberglass is stronger, but is usually more expensive as well. You might find yourself putting in a fiberglass shower pan in an effort to make the bathroom of your dreams, either as part of building yourself a new home or remodeling your existing home. In either case, the project is just about equal, with the main difference being the need to locate the drain. In the case of a remodel, you need to make sure that your new shower pan has the drain in the same place as the old one, unless you are planning on moving the drain. This is easy if you are mounting the shower pan over a wood floor and have access to the underside of it. But if you are installing your shower on a concrete floor, you will be limited to the location where the drain is installed, as moving the shower drain would require breaking up the concrete to move it. In the case of new construction, it is best to buy the shower pan before roughing in the plumbing. That way, you can be sure of setting the drain with the right dimensions. Architects will specify a shower pan, and homes will be built without buying that shower pan in advance; but they tend to stick to well-established brands, in order to make sure that there is no problem getting what they have specified in their designs. The first step in installing any shower pan is to check for fit. Mistake happen and you want to make sure that everything lines up the way it’s supposed to. You’ll be looking for things like seeing if the walls are in the right place, if any corners are square and if the shower pan fits where it is supposed to. If this is a new installation, you need to mark where the drain is located. Just use the drain hole in the shower pan as a template and scribe the circle on the floor. Once you remove the shower pan, you will need to cut out a circle at this location, about two inches larger, to provide room for the drain to go through the floor, without hitting the wood. You also want to mark the edges of your contact area. What I mean by this is that the edges of the floor of the shower pan aren’t going to go all the way to the wall. 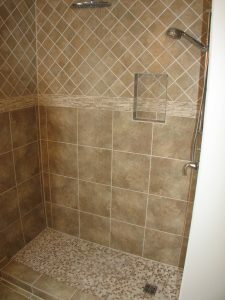 You will most likely have several inches of space, between the part of the shower pan that makes contact with the floor and the wall. You will also have a couple of inches of space at the outside edge, where the lip of the shower pan prevents there from being any contact. 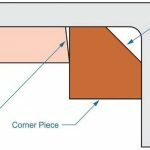 When it comes time to put filler onto the floor, in order to level the pan, it makes no sense to put filler in the area where there is no contact. The most important thing to look at is how level the floor is. For the shower to drain, the pan needs to be level. There can be a slight amount of variance, which the slope built into the shower pan will accommodate, but not much. If your floor is more than 1/8” out of level, than you need to accommodate for this in the installation of your shower pan. The real key to installing any shower pan is in how we level it. You want to check the level in both directions and mark how far out of level it is on the wall studs. Actually, what you want to mark isn’t where the pan sits while it is laying flat on the floor, but rather, where it will be sitting once you level it. You also want to check how much of a gap you will be leaving at the floor level, in order to level the shower pan. If the gap at any point is more than ¼ inch, it may be hard to hide. At ½ inch, you will need to use something more than just floor covering and caulk to hide the gap that will be left. Check the instructions that come with your shower pan, before proceeding, most specifically to find out what materials they suggest using. Some manufacturers will recommend using tile mastic and others might recommend thinset mortar. These recommendations are based upon their testing, and they normally have a good reason for the suggestions that they make. Remove the shower pan and cut out the hole for the floor drain, if necessary. It helps to cut plywood strips or pads to use as shims, if the amount that the shower pan needs to be raised works out to fit standard plywood thicknesses. It is better to use less shim, rather than too much, as you can always make up the difference with the mastic or mortar that you are going to use. These plywood shims should be mailed or glued to the floor and should align with the feet that are glued onto the bottom of the shower pan. If you use construction adhesive, keep in mind that it will add to the thickness of your shim. When you put the pan in place and push it down, these will keep you from pushing it down farther than you want to, when you put it in with the mastic. Dry fit your shower pan in place to check the shims, before attaching it permanently. Then remove the shower pan and attach the drain, putting plumber’s putty underneath the rim, before tightening it down. The plumber’s putty will fill in any irregularities, ensuring a leak-free installation. Even so, tighten it well, so that the shower drain can’t come loose. With the shower pan ready to install, mix up your mortar or mastic, making a thick mixture. You need it to form in lumps, and not run at all, more like clay for pottery or biscuit mix for homemade biscuits. With your trowel, drop the mortar in globs on the floor, in the areas where it is needed. Then place the shower pan on top of the mortar, pressing it down into the mortar until you hit your shims. The shower pan has a lip on it, which is so that you can screw it to the wall studs. Normally, this is done with drywall screws, but you’re better off using a stainless steel bugle head or flat head screw. This will mean that you will have to drill and countersink the clearance holes in the lip, so that the heads of the screws can sit flush with the surface of the shower pan. Don’t overtighten these screws with a cordless drill/driver or impact driver, or you could crack the fiberglass of the lip. Properly installed, the cement backer board should end up flush with the surface of this lip, allowing the tile to overlap from the backer board, onto the lip, covering and hiding that seam.